Leading by example. Well done. Create examples for the country! This is called putting your money where your mouth is. 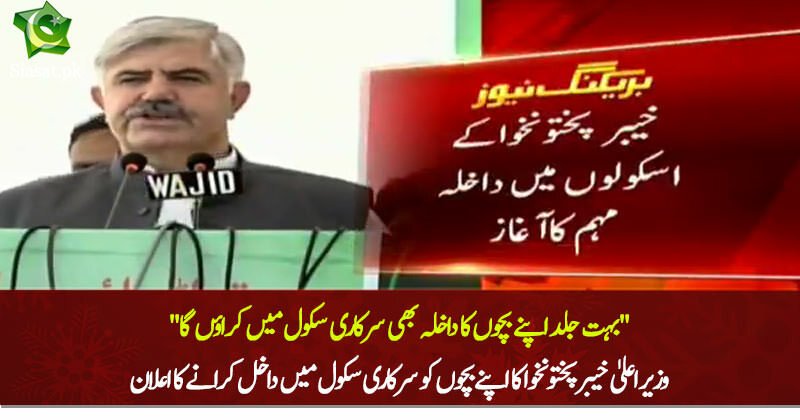 Wo patwari kidar gaya jo kheythay thay k kpk mei kye kr lia ha? Great gesture. Change through personal example. The change we need. God bless him. CM's children going to government school will definitely up lift standard of schools. this is where equality starts from. Excellent work, wonderful. Same syllabus And exam mechanism in all schools. Make uniform Pakistani international level syallabus throughout country. Stop using Oxford and bla bla books it's just waste of Pakistani money. This should be law that everyone in Government in any position must send his children to Public schools and Public Hospitals. Anyway appreciate CM KPK for taking this great step towards one Pakistan. Good but he should introduce a law which mandates all government officials and public office holders to send their kids to Government schools. very bold step .. well done ..
definitely rise, and a healthy competition in education will start, merit will kick in automatically.